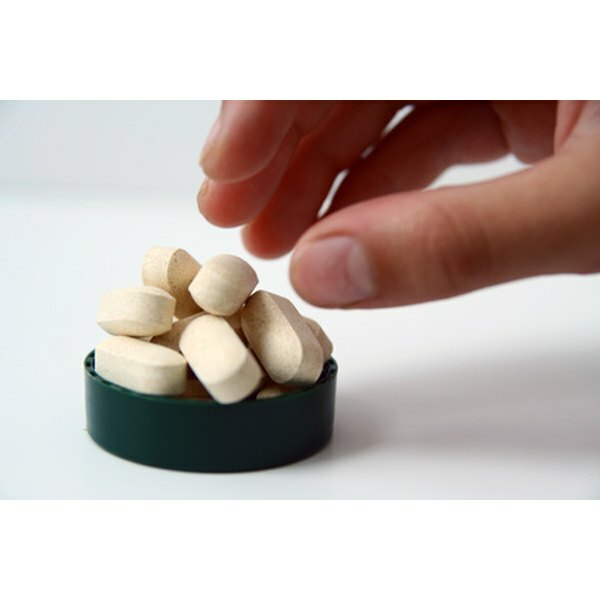 Certain oral supplements may have positive effects on your skin. 1 What Does Pomegranate Extract Do for the Skin? 3 What Is Palmitoyl Oligopeptide? Many topical creams, serums, gels, moisturizers and masks are purported to have anti-aging effects on the skin. Some of these products contain antioxidant-rich vitamins. Antioxidants decrease cell damage caused by free radicals, thereby protecting skin from sun damage and possibly slowing the effects of skin aging. It appears that the oral intake of a few antioxidants may also protect the skin from free radical damage. Vitamin E is a fat-soluble antioxidant vitamin. Fat-soluble vitamins are absorbed from the small intestines and stored in the liver and adipose tissues. Vitamin E protects cell membranes from free radicals. Your skin may benefit from both the topical application and oral intake of vitamin E, according to SmartSkinCare.com. When taken in supplement form, it may also reduce sunburn cells after UV exposure and act as a humectant. Humectants are substances that have a moistening effect on the skin. Ubiquinone, commonly referred to as coenzyme Q10 or CoQ10, is a naturally occurring fat-soluble antioxidant that may slow the breakdown of collagen. Collagen is a protein fiber that helps skin to maintain its firmness. Collagen tends to weaken with age. CoQ10 may help protect skin from extrinsic or environmental aging such as sun damage, as well as intrinsic aging due to genetic factors. A study published in May 2000 in &ldquo;Ceska a Slovenska Farmcie&rdquo; concluded that Co Q10 appears to be suitable as a dietary supplement and as an ingredient for topical cosmetic production. The study was lead by J. Hojerov&aacute; of Katedra mlieka, tukov a hygieny pozivat&iacute;n-oddelenie kozmetol&oacute;gie Chemickotechnologickej fakulty Slovenskej technickej univerzity, Bratislava. Glucosamine may be best known for its purported ability to build cartilage and possibly treat osteoarthritis. N-acetyl-glucosamine, or NAG, is a more stable form of glucosamine that may protect the skin from photodamage, according to the SkinTherapyLetter.com. A preliminary study published in March 2001 in the Journal of Dermatological Treatment found that when glucosamine was taken orally in combination with other amino acids and minerals, it could potentially improve the appearance of visible wrinkles and fine lines. The study was led by H. Murad of El Segundo, California.